When i’ve looked into it, almost every memorable trail that i’ve ridden or hiked has been the result of an organic bottom-up process – Grassroots if you will. Dismiss me as crazy, but I think this bottom-up process is how single-track trails as a group have evolved a depth of character and range of intuitive solutions. I also think qualities like that, when possible, are far preferable to imported engineered solutions. Such complex qualities enrich and differentiate our riding and hiking experiences in a manner cookie-cutter designs can’t. The problem is that getting these grass-root/bottom-up processes working takes time and creativity. This problem is particularly obvious when in place processes are compared to the ready-made solutions floating around that are often straightforward and reassuring to certain agendas. Some people love the ease of top-down solutions and will happily bulldoze with large equipment to create a monolith of soporific trail and sure, these “meat and potato” processes are great news when you’re engineering the 401(a type of trail in a sense), but when gazing at such creations you wonder if they fit in a forest. Certainly their smooth modernity contrasts with a place sculpted by the whims of evolution. 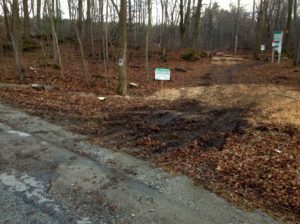 Given the current state of things one must admit that the bottom-up process of creating a trail(or rather allowing a trail to “create” itself) is a luxury. Even with something supposedly as simple as maintaining trails in a forest we find ourselves pressed by deadlines and struggling to find our own solutions or to hybridised versions of the ready-made answers. When relied on too heavily these standardised solutions tend to beige-wash any trail’s character and worse can sew disenfranchisement from the character of a forest. In a respect this makes us quite lucky here in the Agreement Forest(and Hilton Falls) as you’d have to travel over the horizon to find another place that has trails with as much character as those you find in the AF. 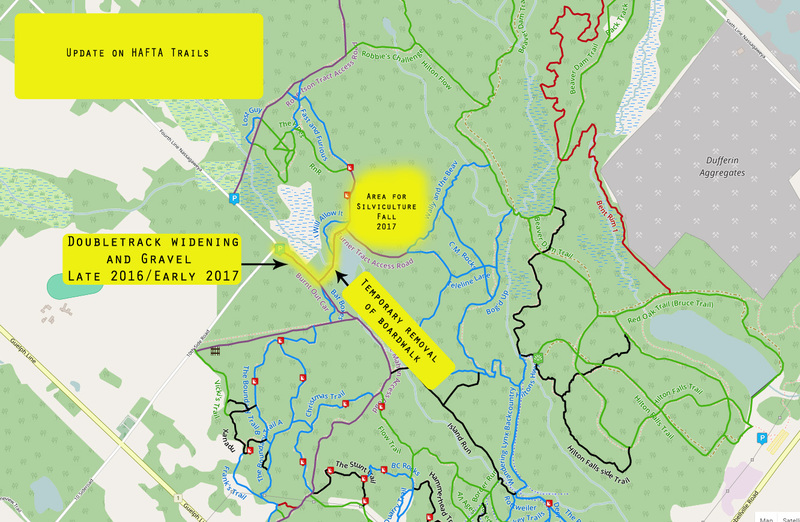 In some sense the Agreement Forest’s meandering and labyrinthine trail system is one created before the reign of experts and standardised solutions. All this talk about cookie-cutter designing isn’t to say every standard solution is awful and they do have a place in our tool kit. Such a case for the standard solution occurred when the bottom-up process going on at Island Run needed to fix it’s increasingly boggy attitude. For certain lengths of the year a dismount on Island Run often meant you were coming out looking like the swamp thing or missing a shoe. Every rock that could be reasonably sourced had slowly been placed in the muck, in the hopes that one might tip-toe down the trail, but the muck slowly swallowed up those rocks. Thus it was that many summers ago, after a particularly wet spring, somebody from the forest community decided a “dimensional lumber” intervention was the only way out of the Island Run pickle. Operating alone there was little to no cash for any materials. Rumour has it the construction materials came from a resourceful person’s reused cedar deck. It certainly looked that way with drooping edges and rocking planks. Some called it a boardwalk and I suppose it sort of qualified. After a decade of decay that so-called boardwalk was simply garbage sitting in the woods, so one sunny Saturday in November 2016 a group of thirty odd like-minded people decided to volunteer their time to help Island Run stay open and safe. They were treated to a spectacular fall day, not too warm, not too cool and lots of sunshine. Shortly after 10am they hiked toward the coffee donated by a local Starbucks on 20 Market Dr(Hwy 25/401) and the free donuts brought to site by board member Rob. Between the parking lot and the coffee was their stash of lumber(Generously provided for forest users by the Region of Halton), so on the way to site everybody grabbed a bit of lumber to help speed up the relay process already going on with a borrowed trailer. How’re the shoulders doing Jenn? Once they had moved a small pile of lumber from the secluded storage area to the staging area volunteers began to transport it into the work site. This trip was over a bridge and down single-track. Being the AF there were rocks on the trail so the process was a fairly tedious one. The bridge got pretty crowded at times as it is really only wide enough for one person. Thankfully no one ended up in the creek. Meanwhile at the boggy area on Island Run a team of volunteers was busy putting together the sub-framing for the boardwalk and laying it into the uneven terrain. This was not an easy task as some fairly large boulders are buried in the tread and had to be wormed around as best as possible with the 8ft long runners. Hey, i am photographing stuff! By about 1pm the lumber had all been transported from the staging area, sub frames were in place and joining/decking was underway. However a short intermission was required as everybody had worked up an appetite moving the lumber and laying the sub-frames. The organisers had planned ahead for this eventuality as a hot sausage(is that street trail meat?) was included to keep any “hangry” volunteers at bay. Lets fire that thing up. Gloves and a thermometer. I am impressed. After lunch the decking continued until every battery on site and in sight had been drained. The board spent a few more evenings that week putting the remaining screws into the decking and it’s now a 100% finished project forest users are enjoying with mud free tires and feet. Thank you to everybody involved! ** Swamp thing also appreciated the volunteers, but is sort of disappointed nobody is going to look like him after trudging through the spring bog. The Region of Halton Forestry Dept, through a contractor, will be engaging in a silviculture operation during 2016/2017. 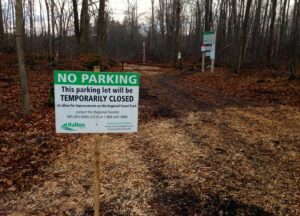 The first step of the operation is to widen the double-track and place gravel down so machinery can gain access to the section of forest that will, in the fall of 2017, be logged of softwood species so that native hardwoods can be allowed a chance to replace the pines. Check out the map if you are interested. Please do not replace the boardwalk, HAFTA will take care of this. UPDATE: Parking is no longer available at the corner of fourth line nassagaweya and ten side rd.